Necessary software in order to read and printing them is included on CD-ROM or DVD. The pack is more than one e-book recorded in the same CD-ROM or DVD (DVD if the size is more than 1 CD) and it's more cheap.All the prices include shipping for America and Australia! OFFER BRITISH PACK: All the books of British heraldry for US $99 - 79 euros. OFFER PACK TOTAL: ALL the books in DVD for US $300 - 248. The greatest collection of Coats of Arms for the families of England, Scotland, Ireland and Wales. 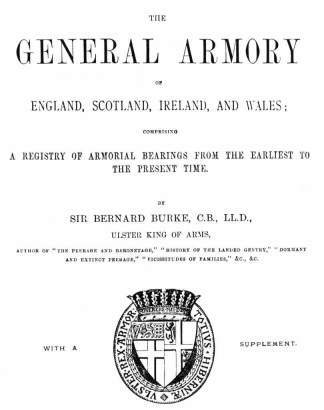 Description: B. Burke 1265pp (1884) The greatest collection of Arms, arranged alphabetically under surnames. 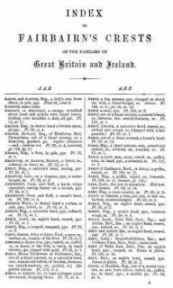 A registry of Armorial Bearings for England, Scotland, Ireland and Wales from the earliest to the present (1884) time. 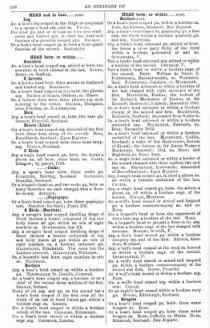 The last edition of Burke's (1884) contains 60,000 names. Burke's is the most easily accessible British armory. 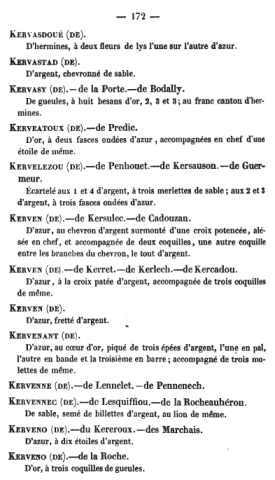 It should be noted, however, that sources are infrequently given, and that Burke's editors collected as many blazons as they could, regardless of origin or accuracy. It is therefore not to be taken as the final word on who is or was using which arms in Great Britain. 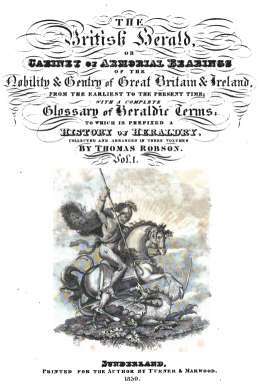 The Burkes wrote extensively and produced a number of genealogical reference books. Include a full manual of heraldry. 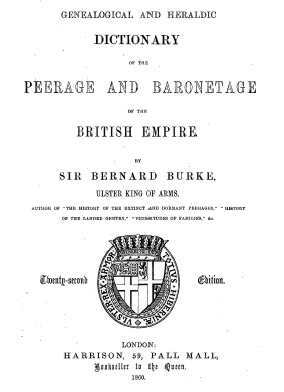 Description: This book contains a listing of the peerage (those with the titles of duke, marquis, earl, viscount, or baron) of the British Empire, as constituted in 1865. It also describes the baronetage (those who are baronets, a class below Baron). and a lot of biographical information, including lineage and the family coat of arms. In PDF format. 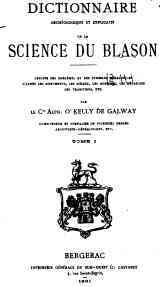 Description: This book registers of all crests known to have been in use in Great Britain and Ireland is the definitive book in its field. The main part of this encyclopedic work is an alphabetical list of about 50,000 names associated with various crests. A crest is an ornament or device attached to a helmet or coronet and pictured above the shield in a coat-of-arms. You'll find a full description of each crest and a reference to the plate in which it is illustrated. Following this section is a list of 5,000 mottoes and the names of the families using them. There is also a key to the plates (which cross-indexes the names of the families assigned to each crest) and a dictionary of terms which serves as a glossary. 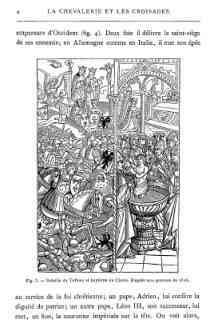 The majority of the book is illustrated and consists of 314 full-page plates and detailed engravings of about 5,000 crests. 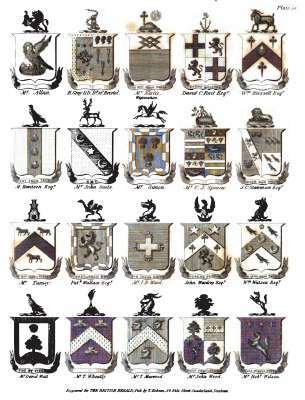 Part 1 contains descriptions of crests in standard heraldic nomenclature arranged alphabetically by the name of their owner; mottos are also included. 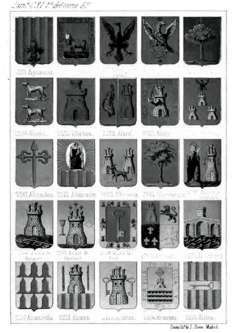 Part 2 contains engravings of a large proportion of the crests described. Thus given a surname one can find the crest and motto associated with various families of that name. 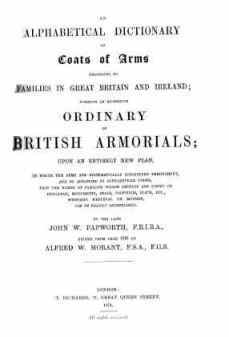 Description: For England, the ordinary which corresponds to Burke's General Armory is John Woody Papworth's Ordinary of British Armorials. Contains much the same information as Burke above, but it permits you to work backwards from a description of the arms. Thus it is an essential companion to Burke above. 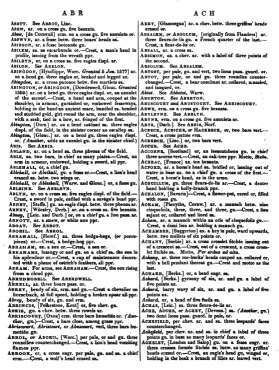 Compiled from a variety of sources, like Burke's General Armory it is useful by virtue of its volume; in common with Burke, Papworth does not state his source in many cases. 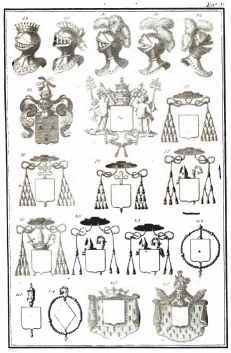 The only work which enables coats of arms to be identified from a description or picture. Pages: 653 (I) + 638 (II) + 434 (III) = 1,725 pages. 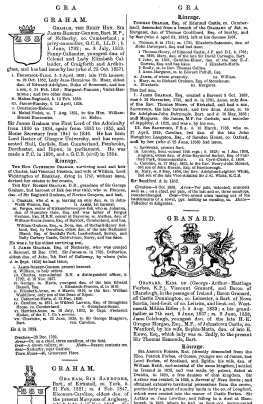 Description: Big summary of coats of arms of families of Great Britain and Ireland, with appendix, manual of English heraldry with many graphics and several shields of families drawn in the third volume. An extraordinary and indispensable work of English heraldry. 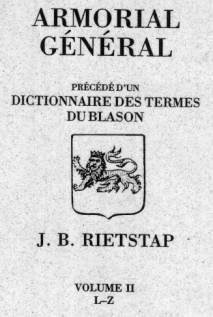 Précédé d'un Dictionnaire des Termes de Blason. 2nd edition 1887, 2 volumes edition 1200 + 1328 pages.+ Dictionary of heraldry with images. 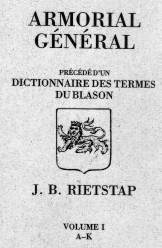 Rietstap Armorial General is a multi-volume work on the coats-of-arms of the world; it is both monumental and without equal, and is the most exhaustive undertaking of its kind. Needless to say the volumes are in French, but the information is stereotyped, and easily understood. The Armorial General is the most authoritative work on the coats-of-arms in the world. The descriptions of the arms cover those of more than 100,000 families, alphabetically arranged and accurately described. The work was compiled from hundreds of armorials and it contains an extensive glossary of terms. In addition to a full description of the arms, most entries identify the nationality of the arms bearer, his title, and the date his title was conferred. 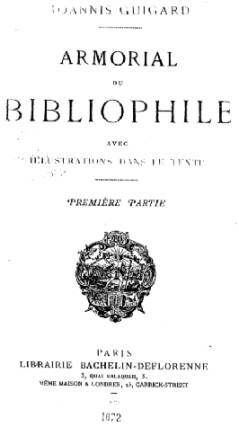 The basic text was established with the publication of the second edition, corrected and enlarged, of 1884-1887. This most important reference work contains the blazons of thousands of Coats of Arms covering the whole world, arranged alphabetically under surnames. Rietstap is the most thorough armorial of European armory in existance. 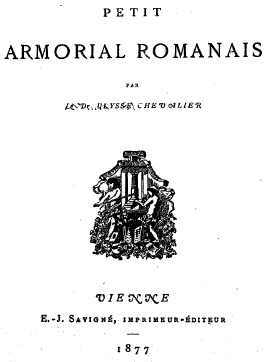 Title: Armorial Général de France. 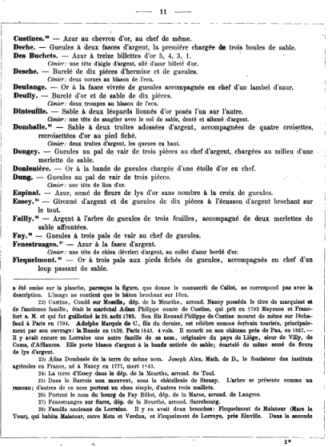 Description: A General Armory of French names. 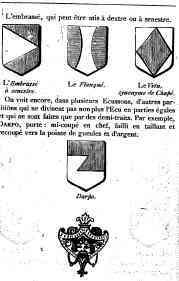 Describe the coats of arms for the main French families. In PDF format. 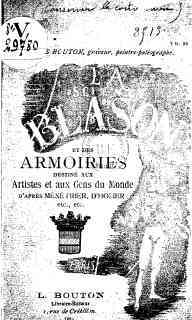 Title: ARMORIAL DE LA NOBLESSE DE LANGUEDOC. 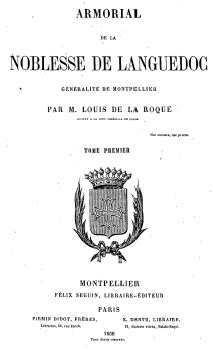 Author: M. Louis de la Roque. Pages: 642 first volume + 492 second volume = 1,134 pages. Description: Stupendous work that picks up the noble last names of the French Languedoc. 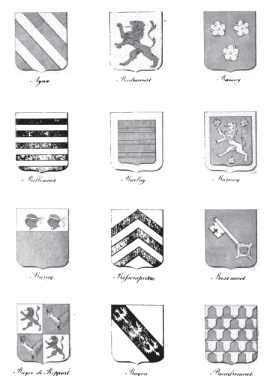 Many last names and lineages with their DRAWN shields and their complete history. 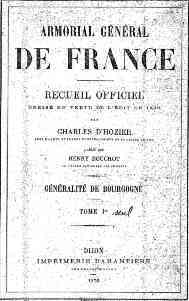 It is written in French. In PDF format. Volumes: 2 volumes. More than 18.000 family names. 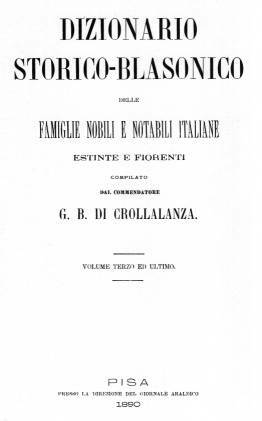 Description: The "Dizionario storico-blasonico delle famiglie nobili e notabili italiane" is a General Armory of Italian families with notes regarding the origins and the history of each and the coats of arms, arranged in alphabetical order under surnames. More than 18.000 family names, with 12 pages of drawings in full color. THE BEST reference for Italian Arms. 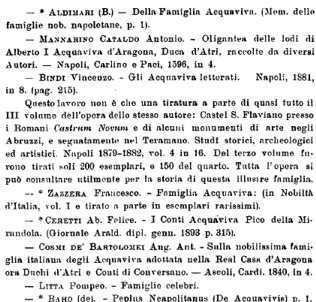 Description: Origin of Italian lineages with mention of the documents that prove this way it. In PDF format. 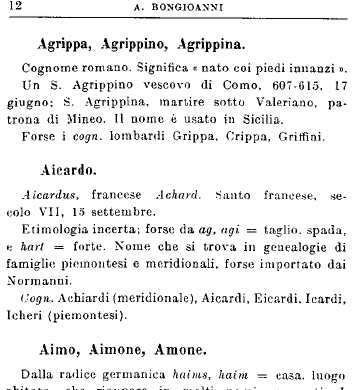 Description: Origin of the names and Italian last names, as well as their etymology. In PDF format. 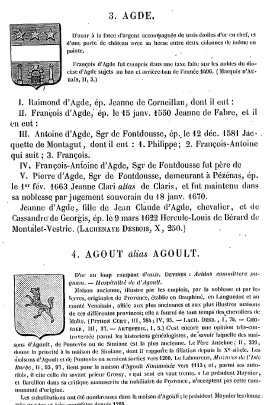 Description: A small jewel of heraldry, it contains near of 2000 family names of French origin with their history and coats of arms DRAWN in black and white. Arranged in alphabetical order under surnames. In PDF format. 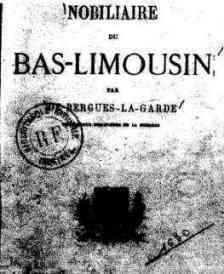 Description: More than 100 family names with origin or residing in the French district of Bas-Limousin, with their full history and coats of arms. Arranged in alphabetical order under surnames. In PDF format. 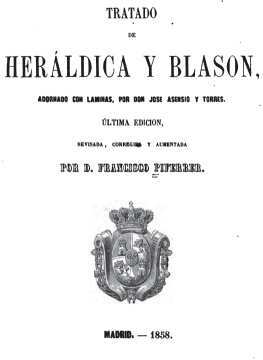 Title: Diccionario hispano de apellidos y blasones. 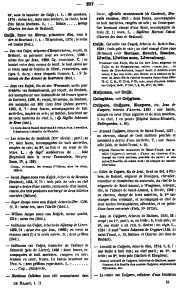 Description: The history and coats of arms for 517 Spanish family names arranged in alphabetical order under surnames. The coats of arms are described and DRAWN IN FULL COLOR. In .EXE format, you need Internet Explorer. 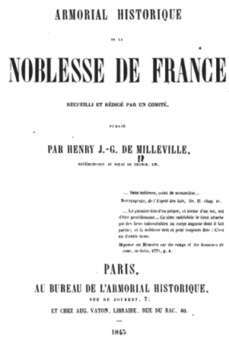 Description: Full manual of heraldry with illustrations, contains the heraldic coats of arms described and drawn and histories of 192 resided families in France as well as history and described and drawn coats of arms of the main villages and French districts with index to the end. As its name indicate, a heraldic treasure. 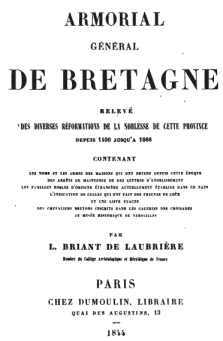 Description: Contains the histories and descriptions for 293 families, lineages and institutions. 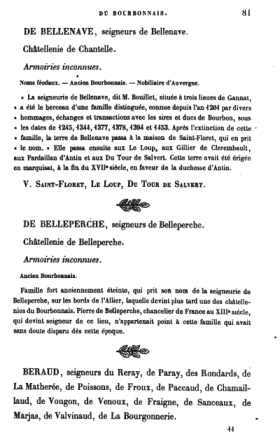 Pages: Volume I: 550, volume II: 634, total: 1,184. 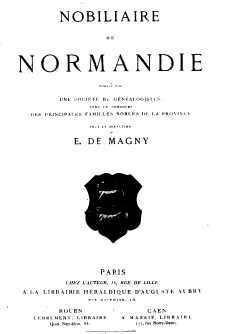 Description: Contains the lineages of the French district of Normandie, with their quite complete history and their corresponding heraldic coats of arms and the majority drawn. Also contains names that are not in any another part. A very complete work. 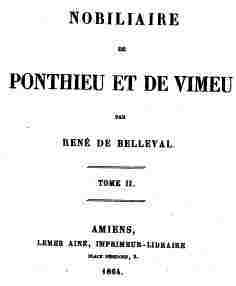 Pages: Volume I: 788, volume II: 656, volume III: 720, volume IV: 712, total: 2,876 pages. 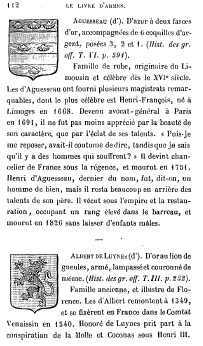 Description: It contains the lineages of the French district of Limoges, with their full history and genealogy. Also described the heraldic coat of arms. A very extensive and complete work. 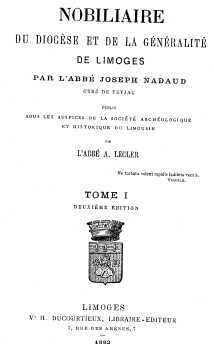 Pages: Volume I: 550, volume II: 550, volume IV: 616 total: 1,716. 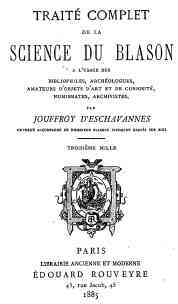 Description: The more complete work dedicated to the heraldry of the Nederlands Belgium, Holland, Luxemburg with the history and description of coat of arms for the families and lineages. It is a very rare work in which the volume III is missing, so we offer the I volumes, II and IV. Many of the names that here are don't appear in other books of heraldry. A very complete work. 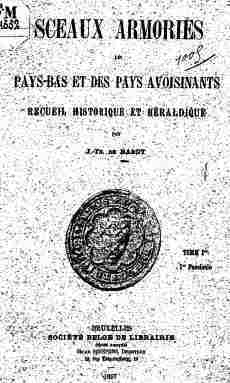 Pages: Volume I: 390, volume II: 280, total: 670. 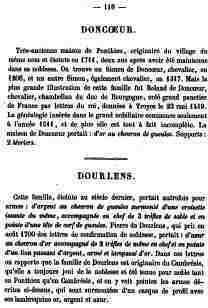 Description: Contains the families of the French district of Ponthieu and of Vimeu, with their full history and described the heraldic coats of arms. A work also very extensive and complete. 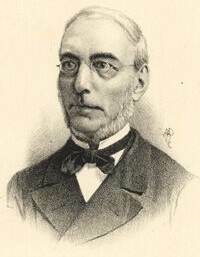 Author: Paul Lacroix y otros. 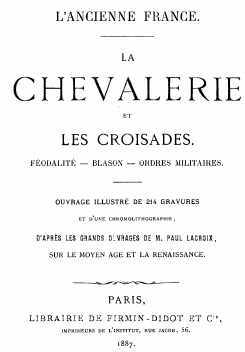 Description: A treasure of book, full of vouchers illustrations, that explain the Orders of Chivalry, the Crusades, the blazons, the feudalism and the Military Orders. Description: Full manual of heraldry in which are explained all the pieces and components, with beautiful illustrations. 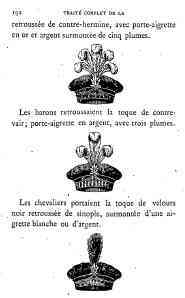 Description: Other complete manual of heraldry, this with more explanations than illustrations. 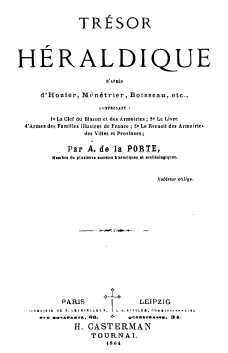 Description: Another manual of heraldry, with many illustrations. The most classic work of the Spanish heraldry. 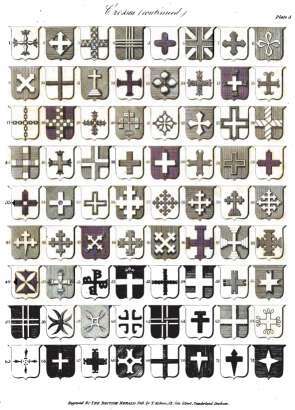 So coat of arms names and lineages, as well as populations (civic heraldry). These six volumes were one of the main sources of the genealogists brothers García Carraffa. 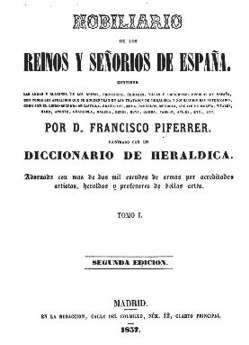 It contains the coats of arms of thousands of Spanish names with their history as well as the weapons and heraldries of the Kingdom, counties, cities, villages and main towns of Spain, with all the last names that are in the heraldry treaties and nobiliary more authorized as the "Libro Becerro de Castilla", the "Grace Dei", Mejía, Barcelós, Mendoza, Argote of Molina, Vital, Haro, Aponte, Guardiola, Berni, Moya, Vargas, Avilés, etc. The work is adorned with more than 2000 coats of arms drawn for credited artists, heralds and professors of Fine arts, as well as beautiful sheets. This is an extraordinary and indispensable work for all the people interested in heraldry. 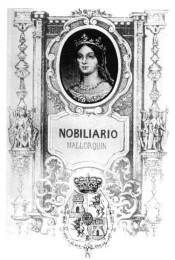 Include the origins of the names and lineages of the Spanish, their solar houses, illustrious people that have enlarged them with their virtues and feats; genealogies of several branches spread for Spain; their titles, mayorazgos, linkings, chaplaincies, memoirs and other foundations; badges that have enjoyed their persons, with their inventions, writings, works and their COATS OF ARMS. 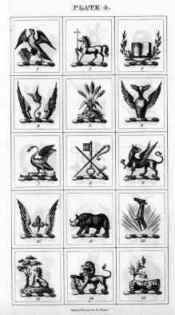 The first volume include the symbolic meaning of the heraldic figures. An extraordinary and indispensable work of Spanish heraldry. 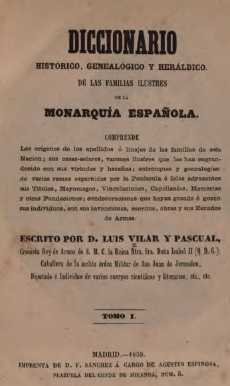 Description: Complete manual of Spanish heraldry where it is explained each heraldic element thoroughly, medals, crossings, etc., as well as their history and meaning. Military orders, Spanish and from other countries, as the Order of the Black Eagle of Prussia or the Bear of Switzerland. With a lot of explanatory sheets with images. It is an indispensable book to interpret any heraldic shield correctly and to know what means. 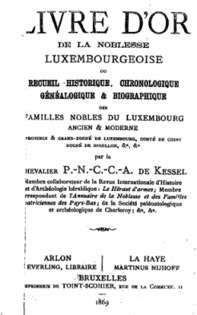 Origin, history, description of coats of arms of 793 last names from Luxemburg. 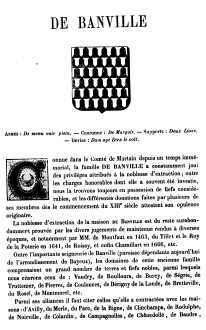 Origin, history, description of coats of arms of many French names, as well as drawn shields and even drawings of their solar house in some cases. 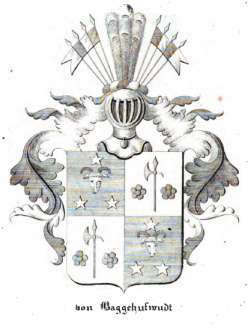 Armorial of the families from Bourbonnais (France). 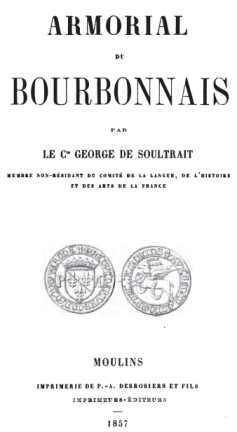 Contains the histories of the lineages and family names from Bourbonnais, and their coats of arms, described and drawn. 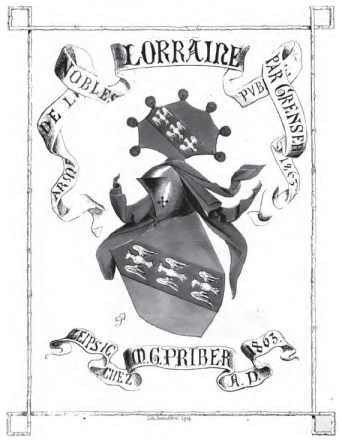 Armorial of the families from the French Britain. With near of 3,000 shields ordered by last names. Author: Alfred Grenser, of one manuscript by Jean Callot, herald of the Duke Charles II. 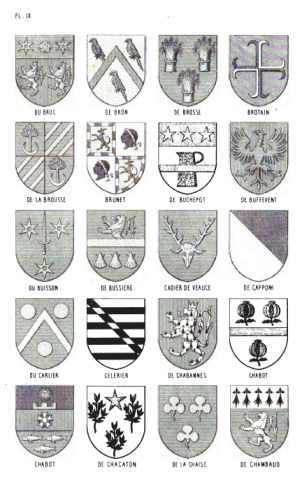 Family names from Lorraine (France) and their coats of arms, described and drawn. 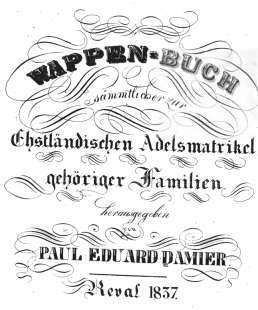 Description: Images coats of arms of German names with great definition and artistic quality, in black and white; each coat of arms with the name or title. Price: US $ 39 included shipping / Europe 25 euros included shipping. All the prices included shipping!